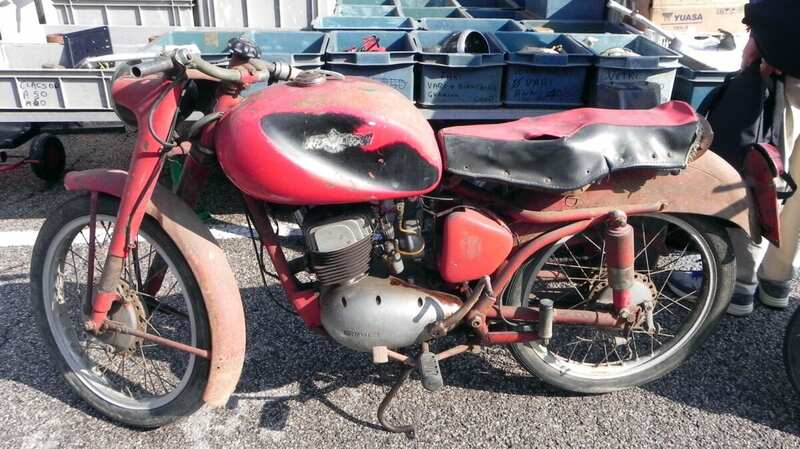 I have an interest in all things Italian where motorcycles are concerned, so we planned to visit the jumble during our holiday in France and Italy. Apart from a thunderstorm on the Friday evening, the weather over the weekend was extremely good – in fact maybe a little too hot for autojumbling. We stayed close to Ravenna, a nice, non-industrial city with a thriving port. It’s about 50km away from the circuit; useful because accommodation close to Imola can get booked up very early. At the end of season there’s still some space in the campsites by the beach. A two-star hotel room costs €42-50 per night. We stayed in a self-catering beachside cabin for €212 for four nights with lots of space – and even air conditioning. 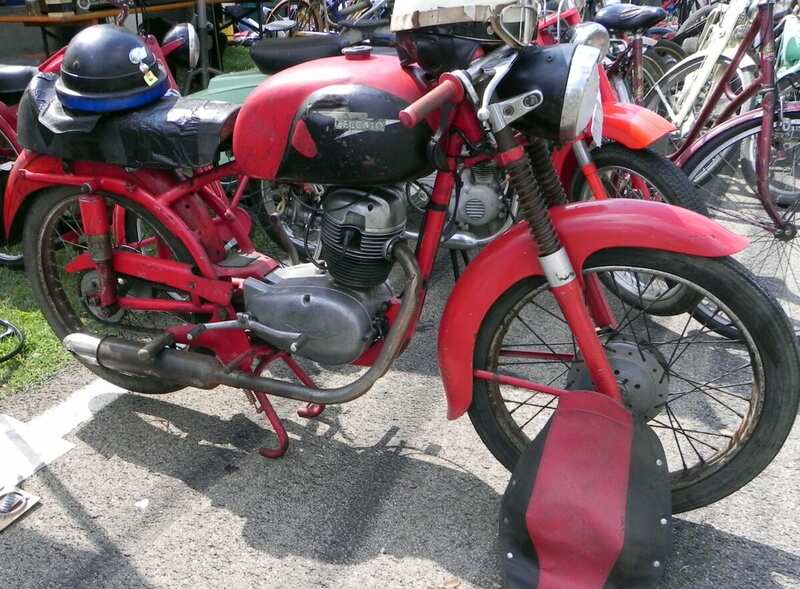 The area around Imola seems to be a centre of fruit production – apples, pears, plums, kiwi, etc – and they are just beginning to pick when the autojumble is on. So the backroads can be blocked sometimes with tractors pulling the full fruit crates. The circuit is on the Via Santurno in Imola, right next to the town. It normally opens noon on the Friday, 7.30am on the Saturday, and finishes at 6pm on Sunday. Admission is €10 euros per person per day. It’s advisable to get there early, before 9am, as parking is… ‘interesting’. Most of the parking spaces on Imola’s circuit is taken up with the stallholders’ vehicles. If you’ve been to autojumbles in the UK like Beaulieu, Netley Marsh or Newark then you might think that you would be prepared. Well, Imola is really something else. The whole length of the circuit has stalls on both sides, plus the pits and the parking area. It seems to be one of those events that the whole of Italy head for… along with visitors from the UK, Belgium, France, Croatia, Slovakia, Spain, USA – just about everywhere else. My other recommendation is that you need two days as one day doesn’t do the place justice. We were there for nearly seven hours and didn’t see everything. Also, take a packed lunch as the Italian offerings may not be to your taste. Once you’ve crossed the Channel, Imola is about 1400km depending on your route. The Alps get in the way so you have to go over the passes or through tunnels. That makes it a two-day trip to get there and two days back, plus motorway / tunnel tolls. Altogether this means it’s not a cheap undertaking, unless you share costs with like-minded buddies. You can make it part of a motorcycling holiday, visiting places like the Guzzi museum in Bologna. 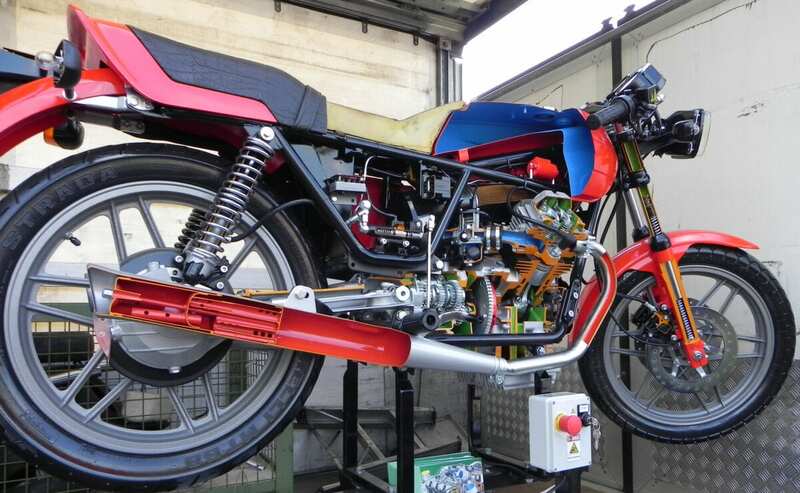 As you might expect, the majority of the parts are for Italian motorcycles, bicycles and cars, plus tools, a few antiques and a few Japanese and British parts and bikes – but overall not many compared to the Italian stuff. 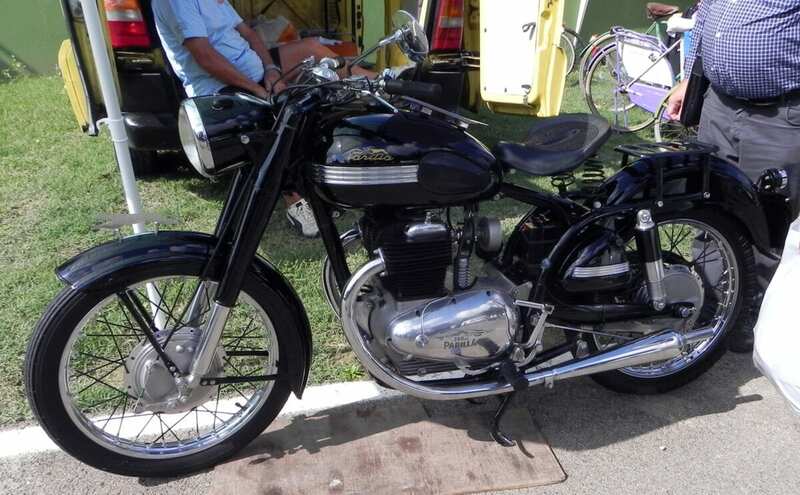 I saw one Velocette for sale; a 350cc MAC for €7950 which by UK standards was well overpriced. 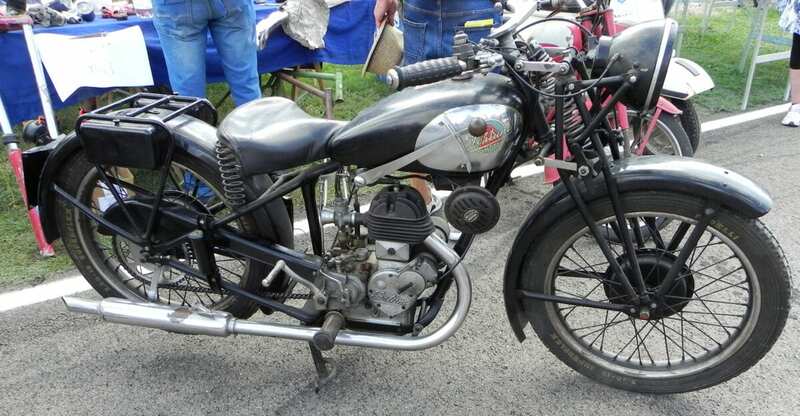 And a few Matchless machines – probably left over from the war. Imola seems to be the time when the Italians clear their sheds, fields and henhouses (judging by the state of some of the stuff) and bring anything auto-related they have lying about. 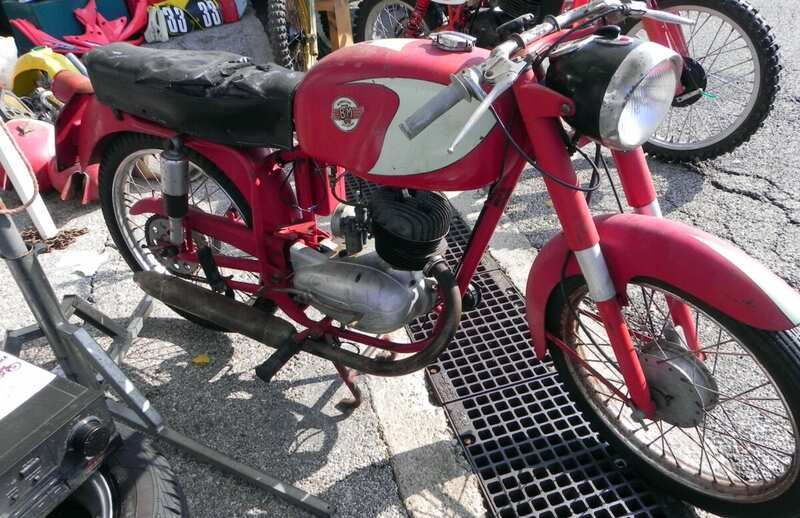 It is possible to grab a bargain but Italians know their bikes and sometimes have a rather inflated opinion of the value, especially the dealers. The best bargains are to be found with the older guy who has a couple of bikes from his collection that need refurbishment. 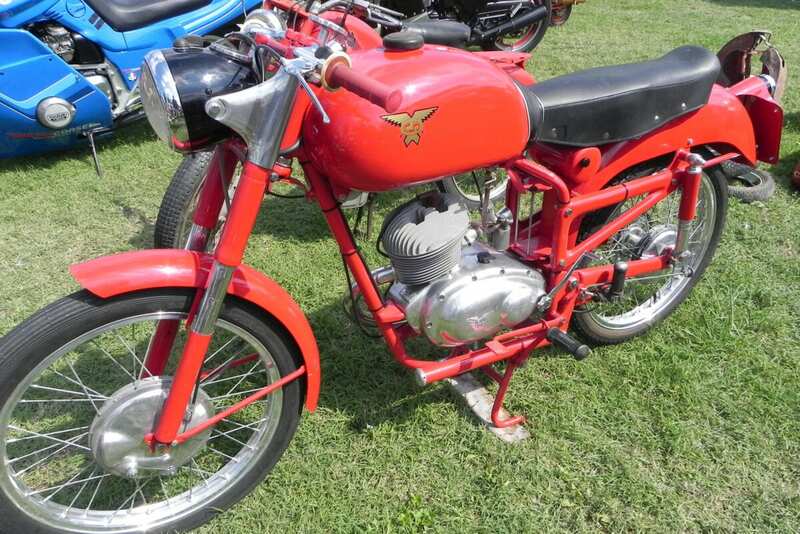 If you need to ask the price of this cammy Mondial 175 then… you can’t afford it. 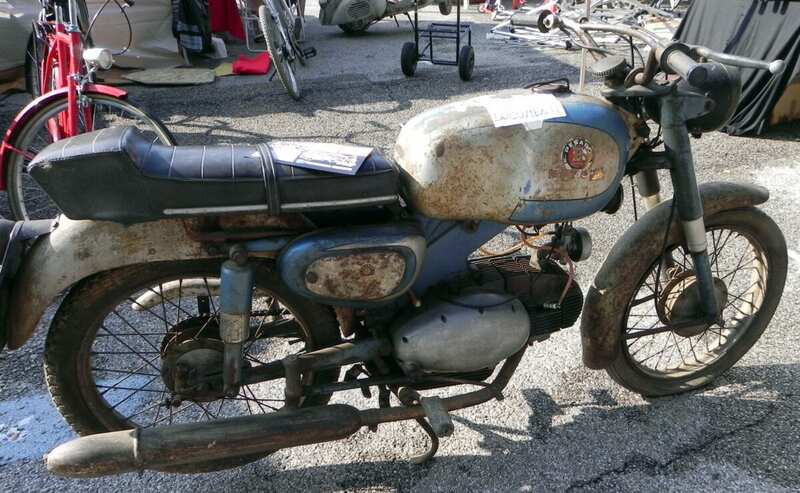 Along with many standard bikes, in need of rebuild or already restored, there are a few specials on display. 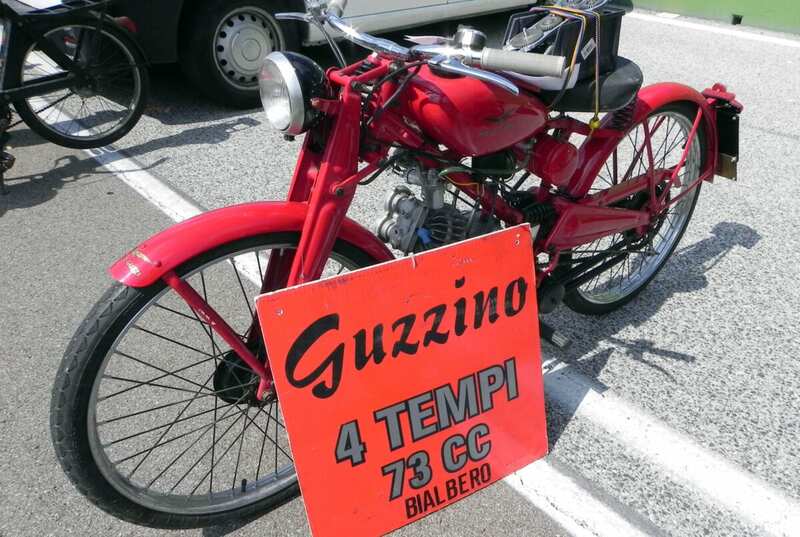 My favourite was a dohc Guzzino of just 73cc. Unfortunately (surprisingly!) I did not buy anything. The bike I was really keen on – a Bianchi Tonale ohc 175 had been sold. Maybe if I’d gone back on the second day and seen everything I would have found something else I liked. 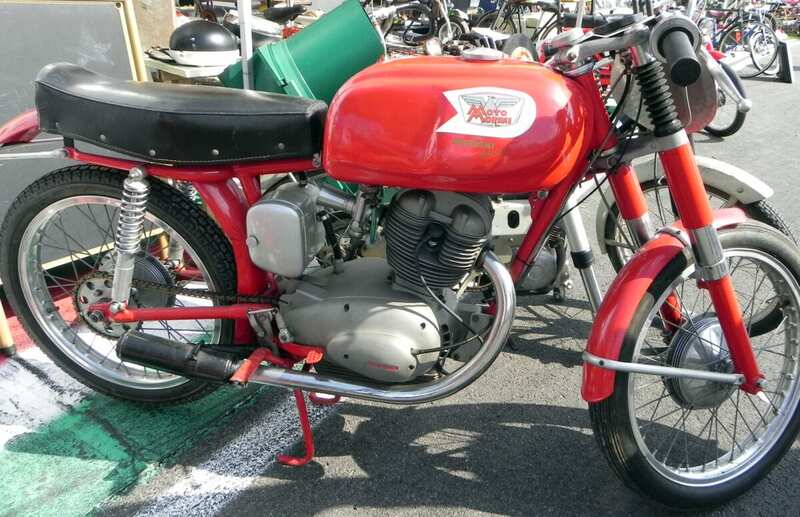 The Ceccato was tempting and there was a nice Motom 48cc for €600 euros which could have been haggled down a bit. There were also a few unusual bikes which I had never seen in the metal before, like a Ferrari and a Maserati; but they didn’t look any better than most of the other bikes around. There seemed to be more Morinis and Gileras than any other marques; testament perhaps to the build quality of the Morinis and quantity of Gileras made and sold. There were quite a few Mi-Val machines, a rare beast in the UK, in need of rebuilding. 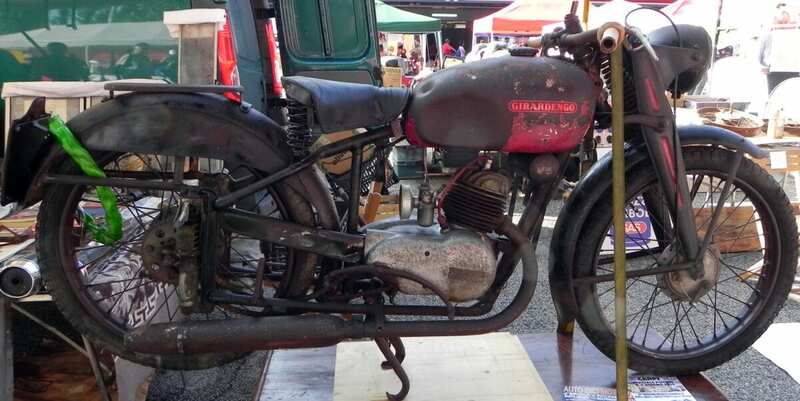 There were very few pre-war machines for sale. These seemed to only be in collections and club stands. 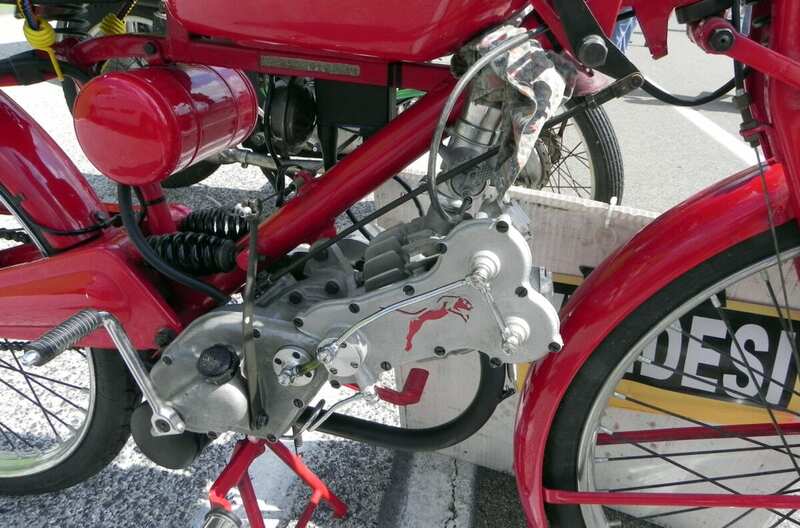 Many early Bianchis and Moto Guzzis were made but they seem to be hidden away. 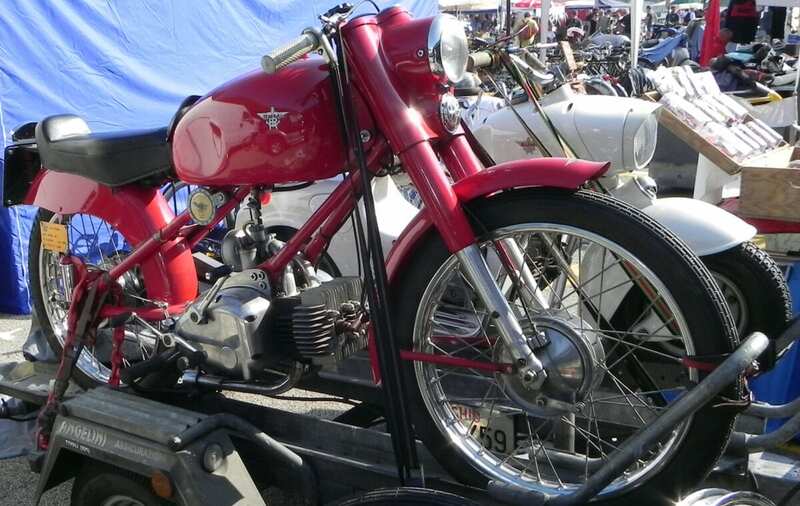 The most popular bikes for sale were from 1950, with just a few Bianchi Bianchinis from the late 1940s. In the UK, we tend to think of three or four big Italian marques (Ducati, Guzzi, Laverda and the like) but I saw and photographed 36 different makes of Italian motorcycle. I’m sure there were more that I missed! 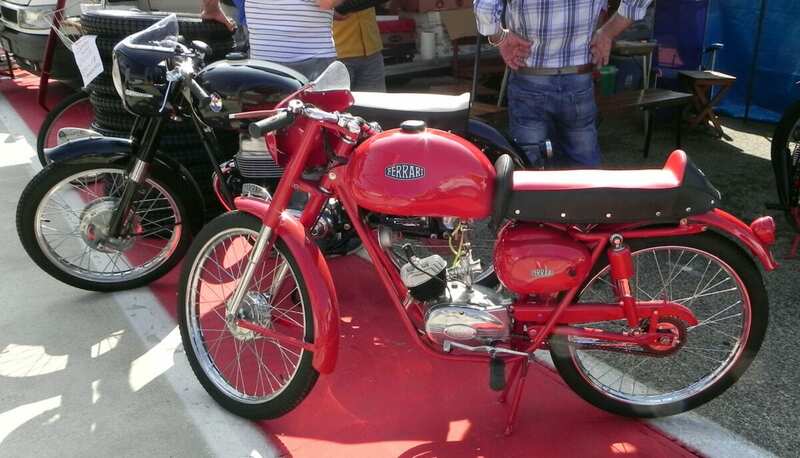 There weren’t many high-capacity bikes on display or up for sale, as the majority of Italian motorcycles were of a small capacity. 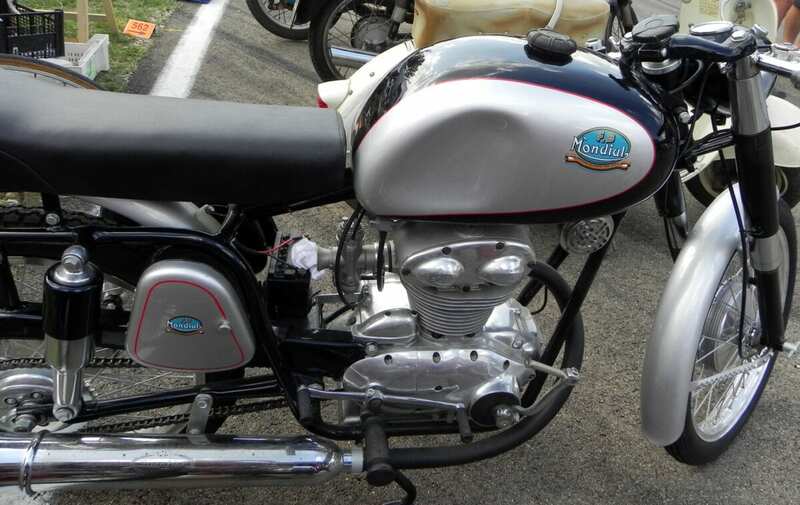 A large Italian classic is usually a 175 or a 250. There was one really nice bike being shown by its proud owner; a Parilla 350cc parallel twin. 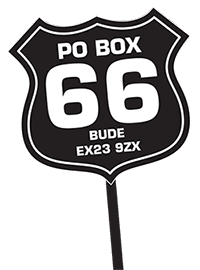 So if you feel like a holiday in September with a motorcycling connection – not too far from the beach – Imola could be ideal. I for one will certainly be going back, but a little more prepared the next time!